Industrial Safety Equipment offers hearing protection devices such as ear plugs, ear muffs, hearing bands and more from the following quality manufactures: Radians, Elvex, 3M, Moldex, EAR, Howard Leight, Bilsom, Peltor, North Safety Products, and MSA. Howard Leight Max-Lite Corded Earplugs, NRR 30. 100 Pair/Box. 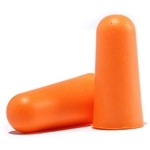 Howard Leight Max-Lite Earplugs, NRR 30 (LPF-1). 200 Pair/Box.